The first thing I always notice about her is her hair. It’s a distinctive fusion of two styles: the mountain of coils bound with gold is purely Egyptian, but her fringe of curls is borrowed from the Flavian ladies of Rome. She wears more gold on her wrists, ears, and fingers and around her neck, which shows the first folds of age. Her skin is coppery, her eyebrows thick and sloping, her eyes wide. Her face is frozen in the beginnings of a hesitant smile, but not the cryptic “Archaic smile” of the oldest Greek art. It is the smile of someone who has just taken the hand of the psychopomp, jackal-headed Anubis or winged Hermes, ready to lead them to the next world. Frightened, but hopeful; happy to be going, but a little nervous all the same. Her name was Artemidora, Gift-of-Artemis. Today, you can find her sarcophagus in New York City, in the Met’s Egyptian galleries. But near the end of the first century, she lived in the Egyptian city of Cusae and was buried in the nearby necropolis of Meir. She lived. She died. She ate. What can we say with certainty about Artemidora’s life? We know from the splendor of her coffin that she was wealthy. Her father Harpokras must have been a local aristocrat and an important person in his community. In keeping with contemporary custom, she was probably married at the onset of puberty to a man older than her, perhaps by as much as ten or fifteen years. Likely her husband was as noble as her father. They may even have had the same father, as sibling marriage was not uncommon for upperclass Egyptians, even those of Greco-Roman extraction (the first Greek pharaoh to adopt this local custom was given the mocking moniker of Philadelphus, Sibling-Lover, by other Greeks). Artemidora, side view. All photos are my own. Egypt, long a multicultural society, was particularly so by the end of the first century. By then, it had been a province of Rome for one hundred and thirty years and ruled by a Greek elite for two centuries before that. Artemidora was part of that elite, whose culture and ancestry were a unique fusion of Egyptian, Greek and Roman. Not only her hairstyle but her clothing and the style of her coffin display a blend of these influences. She was adorned with icons of Egyptian deities but named after a Greek goddess. For most of Artemidora’s lifetime, Rome was ruled by the increasingly draconian Emperor Domitian, who tried to purge subversive influence by expelling Rome’s philosophers. Hated by the Senate in his final years, Domitian was assassinated in a political coup in the year 96. All eyes were on Rome in Artemidora’s time, and she and her family surely had their own opinions on the Emperor’s paranoid antics. Perhaps they whispered about the tragic scandal that marred Domitian’s private life: the extramarital affair he conducted with his own niece Julia Flavia, whose sudden death, some said, resulted from a forced abortion. This story has an eerie 20th-century parallel in the relationship between Hitler and his niece Geli Raubal, who would also die young under suspicious circumstances. Artemidora died at 27 (as did Julia Flavia). By the time they reached that age, most first-century women had experienced pregnancy and motherhood, and many had experienced losing a child. In the Roman world, half of all children died before the age of ten, a quarter of them before age one. Birth was dangerous for mother and baby alike, and Artemidora might have died in childbirth, or from illness or accident. However she died, her “untimely” passing was mourned by her family and celebrated with creation; in this case, the creation of art in her likeness. In the spirit of this tradition, the following meal is dedicated to the memory of Artemidora, gone before her time, in another time. χαῖρε! Artemidora’s cuisine, like so much else about her, was likely a mixture of Greek, Roman and Egyptian elements. How much came from what culture is difficult to say with certainty. It might have varied from meal to meal, and depending on who was working in the kitchen and whether there were guests in the home. Amongst the three cultures there were broad culinary similarities, but many differences, including in how food was served and eaten. 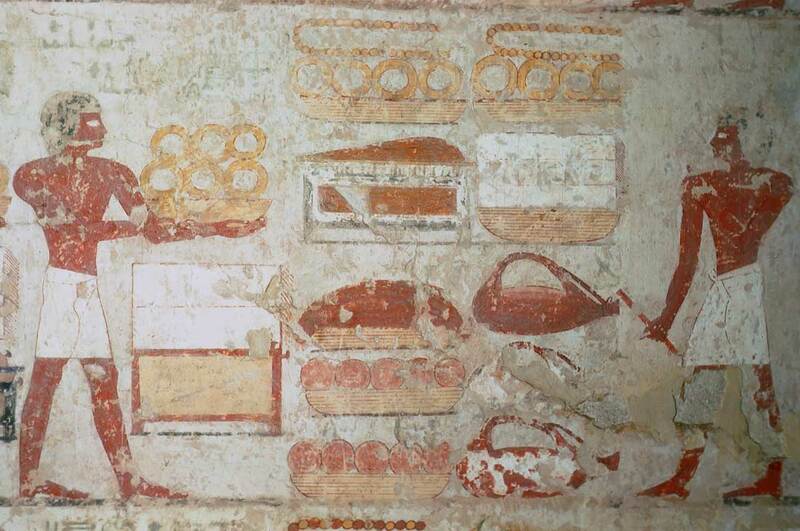 Romans and Greeks had food brought by servants to a communal table, but Egyptians had servants carry trays of food around the room and offer them to guests, cocktail hour-style. Roman men and women dined together. Greek women dined separately, after the men. Egyptian men and women dined together but were seated separately. We know that the Greeks who settled in Egypt did not wholly give up their native diet. In the Deipnosophistae, an important text on Ancient Greek cuisine, the Greco-Egyptian author describes a feast served in his hometown that has no Egyptian features whatsoever: a simple, hearty meal of pork and vegetables on top of bread, with wine to drink. Pork was unpopular with native Egyptians, but their cuisine made full use of the region’s native flora and fauna, from tiger nuts and papyrus shoots to Nile tilapia and Egyptian goose. Artemidora might have enjoyed Egyptian delicacies like hedgehog, which was baked in a crust of clay so that the spines would come off when the clay was cracked open, or chickens hatched in specially-designed ancient incubators. Her family’s wealth would have enabled them to acquire ingredients out of the reach of most Egyptians, such as red meat, imported dried spices and Greek wine. They may have joined other Greek aristocrats in spurning local beer as the drink of peasants and farmers. Egypt was the breadbasket of the Roman Empire, and Artemidora probably enjoyed wheat bread, from flour milled as white as was possible in her time. Not pictured (mercifully? ): the author eating this meal ancient style, with no utensils and using the bread as a napkin. For my own dinner for Artemidora, I chose to start the meal with a salad of romaine lettuce dressed with olive oil, white wine vinegar, garlic, coriander, cumin and rue; a mixture of ingredients popular with Greeks, Egyptians and both. While bitter lettuces had been known in Egypt since ancient times, eating the greens as a starter course was first popularized there by Greeks and Romans during the reign of Domitian; i.e., Artemidora’s lifetime. The main course is roast loin of pork in a nod to Greek tastes, but basted with an Egyptian-style sauce of honey, vinegar and spices, including fragrant fenugreek and tart, lemony sumac. The siton, the grain backbone of a Greek meal, is white wheat bread, sourdough in imitation of many ancient breads. I enjoyed it as Artemidora would have done; with my fingers, and wine. The lady Gift-of-Artemis reclines at a banquet in her finest jewels. Her eyes are blackened with kohl past her eyelids, and her coiled wig drips perfume. Beneath draperies and wreaths of flowers, the men and women of Cusae dine together, in the Roman style. She speaks to them in Greek, but calls to a servant in Coptic for more wine. Servers circulate around the room in the Egyptian style, offering different delicacies on trays. A young man brings a dish before her; sliced pork in a reddish sauce. Artemidora smiles, inhaling the scent of honey and spices. Delicately, her henna-dyed fingers lift a slice of meat to her painted mouth. She chews, swallows, sips wine from the refilled glass at her side. Fruits and vegetables indigenous to Africa played an important role in the Ancient Egyptian diet. Some of these, like okra and watermelon, have since become popular throughout the world. Others, like molokhia and moringa, remain less widely-known outside their original place of origin. In this latter category is the versatile and nutritious tiger nut, which is not actually a nut but a small, hard tuber that grows underground. Tiger nuts appear to have been originally farmed in Egypt, many thousands of years ago. Although some modern farmers consider them a weed, they are rich in nutrients like fiber, potassium and magnesium. The tiny tubers are joining amaranth and other foods of the ancient world that are currently being rediscovered by modern food trends. Google “tiger nuts” and you’ll turn up countless articles referring to them as a Paleo superfood. Like real nuts, tiger nuts have many different uses. They can be eaten raw or roasted, with a texture and lightly sweet flavor much like a macadamia or Brazil nut (or a raw Asian sweet potato, as I noted when I was in Maangchi’s Korean grocery store video). They can be ground into tiger nut flour, which has seen some popularity for gluten-free baking. I’ve also ground the nuts, mixed them with water and strained to make tiger nut milk. While it was delicious, it went bad after an alarmingly short amount of time (48 hours), even though I stored it in the fridge. It must have been a special treat indeed for ancient peoples living in hot climates without refrigeration. When the North African Moors conquered Spain, they brought the custom of drinking tiger nut milk with them. Mixed with cinnamon, cloves, and honey or raw sugar, it became the original form of the creamy beverage horchata. The Spanish word for tiger nut is chufa, and horchata de chufa is still popularly consumed in Spain today. North Americans are more familiar with rice milk horchata, which was developed in colonial Mexico by Spanish colonists who missed the chufas back home. The Egyptians, for all their other cultural achievements, left no known cookbooks behind. This recipe is as close as we can come to following an Egyptian’s written instructions. It was reconstructed based on steps depicted in a tomb painting, part of a comic-strip like longer scene depicting servants preparing many different foodstuffs for a feast. Rekhmire, the owner of the tomb, was a government official during the early New Kingdom period (1400s BCE), a bright and prosperous spot in Egypt’s long history. The key ingredient in Rekhmire’s tiger nut cakes is tiger nut flour, which you can purchase online or in stores that carry health foods. Tiger nut flour is more gritty than grain-based flours, but some brands are ground finer than others. If you’re buying a different brand than the one I linked to, check brand reviews first. Combine ingredients, knead into a dough and set aside for 30 min. On a lightly floured surface, roll or press the dough out to a rectangle about 1/2 an inch thick. Cut into quadrants, then cut the quadrants diagonally both ways to create small triangles. Melt about 2 tablespoons of butter in a frying pan over medium heat. Place as many triangles of dough as you can fit into the pan, and let them fry on one side for 2-3 minutes. Then flip them, drizzle some of the honey into the pan, and fry on the other side 2-3 minutes more. Add more butter and honey as needed to fry the rest of the cakes, and serve warm. The cakes have a very dense, heavy texture and are not as flexible or light as many modern baked goods. However, they are also fried in butter and drenched in honey, which hide a multitude of shortcomings. IX out of X.